Prime Minister Justin Trudeau and most of the premiers signed a historic pan-Canadian framework Friday to fight climate change and meet the country's 2030 emissions reduction targets, but a day of tense talks failed to convince two provinces to get onside. 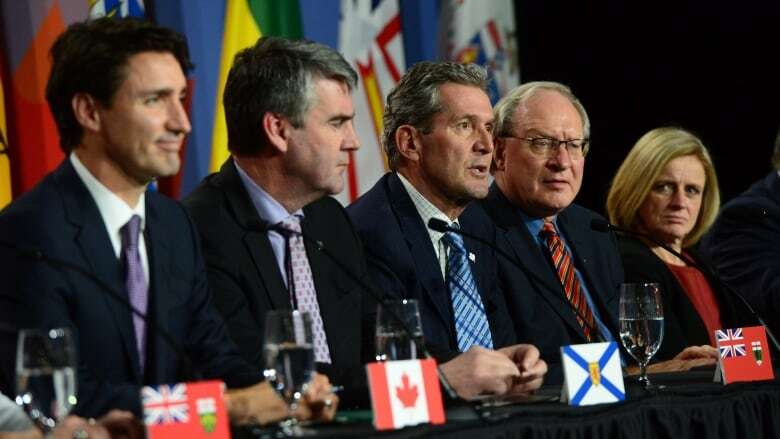 Saskatchewan and Manitoba both said they would not be able to sign the agreement Friday. Saskatchewan Premier Brad Wall has steadfastly opposed any sort of carbon pricing and didn't waver, saying it would be foolish to impose a levy with the imminent arrival of president-elect Donald Trump to the White House. Trump has vowed to scrap many of the green-friendly regulations implemented by President Barack Obama, and this week appointed a climate change sceptic to head the country's Environmental Protection Agency, Wall noted. He said it's unlikely Canada will be able to convert Trump into a climate change warrior. "I'm just saying, let's not be naive as Canadians. This is our number one not just trading partner but competitor for investments in energy ... and we need to be competitive with them. And that's some of the concerns we have," Wall said. Trudeau quickly shot back at Wall. "I think all Canadians know that Canadian climate policy will be set by Canadians, not by whomever happens to be the president of the United States." Manitoba Premier Brian Pallister was the other holdout. Throughout the day, Pallister pivoted to talk of more health care funding when asked about his willingness to sign the climate deal. 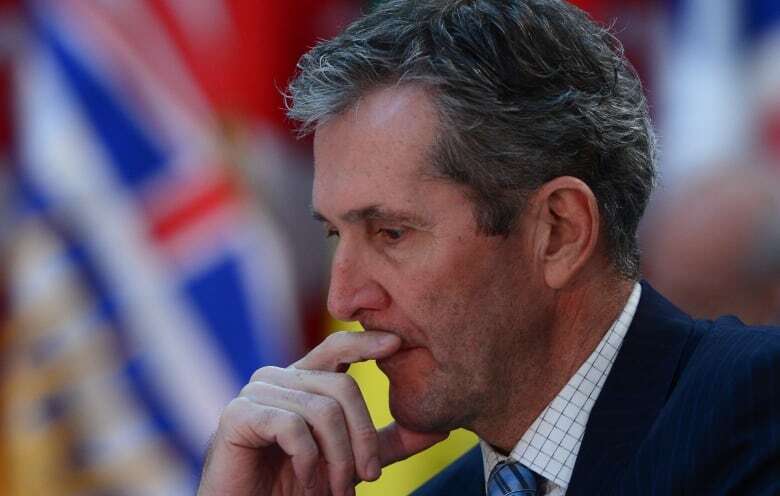 In the end, Pallister said his number one priority is pushing the federal government off its commitment to cut the health escalator from six per cent to three per cent a year, citing his province's dire need for an influx of cash as it struggles with an ageing population and the health needs of a large Indigenous population. The first ministers discussed health dollars over dinner at Trudeau's residence Friday evening. The Prime Minister's Office told CBC News that the two sides are unlikely to reach a consensus on that file at this point. British Columbia Premier Christy Clark, who initially balked at the deal, said B.C. would sign on after receiving assurances the plan would ensure the provinces' various carbon-pricing plans were equitable. "British Columbia's carbon tax will go up when the rest of the country has caught up to us," said Clark. "There was an issue of fundamental fairness that we needed to see resolved in the agreement, from B.C. 's perspective." Clark said the plan includes a mechanism that will allow B.C. to ensure it is not paying a higher carbon price than other provinces. Trudeau said Friday the federal government will impose a carbon price on the two non-signatory jurisdictions, despite their objections. The price starts at a minimum of $10 per tonne of GHG emissions in 2018, rising by $10 each year to $50 per tonne by 2022. All of the money raised will be returned to the respective provinces, who can, in turn, distribute those funds to their citizens in the form of tax cuts. The final agreement also includes a long list of already announced measures to battle climate change, including new building codes to boost energy efficiency, more charging stations for electric cars, and expanding clean electricity sources and upgrading power grids. All of these efforts will help Canada meet its Paris targets, the government said, even as the federal government green-lights major energy infrastructure projects, such as Kinder Morgan's Trans Mountain pipeline and Pacific Northwest LNG, which will be massive emitters when built. The Paris agreement commits Canada to a 30 per cent reduction in greenhouse gases from 2005 levels by 2030 — the same goal proposed by the previous Conservative government. There is a fear that provinces with a cap-and-trade program, namely Ontario and Quebec, will not reach the price targets called for in the national plan. A cap-and-trade program is far more complicated than a carbon tax because it relies on a market-based system of carbon credits to ensure big polluters lower their emissions, and there is no guarantee that a province will be able to fetch a certain price for a credit. The EcoFiscal Commission, a group of Canadian economists who study carbon pricing, estimates Ontario's plan will have a price of roughly $19.40 per tonne by 2020 — lower than B.C. 's existing $30-a-tonne carbon tax. Wynne said Friday it was a "red herring" to focus strictly on the dollar amount of a province's carbon price. She said Ontarians have carried the heavy burden of higher hydro rates because of the province's rapid divestment of coal-fired power plants. Earlier in the day, when talks were seemingly off the rails, Trudeau took the unusual step of delivering a 14-minute speech during an event that had been billed as only a photo op. He took aim at an argument Wall has used in the past to justify his opposition to carbon pricing — namely, that Canada should not imperil its economy with a new tax when the country only accounts for two per cent of global greenhouse gas (GHG) emissions. "I guess the question is: Why bother even trying? Well, I can think of a number of reasons," Trudeau said. "First of all, it goes without saying, if everybody took that view, nobody would do anything — and I don't want to imagine what the planet would look like in the next century." U.S. Vice-President Joe Biden sought to reassure Trudeau and the premiers earlier Friday that the imminent administration change does not mean his country has given up on fighting climate change. 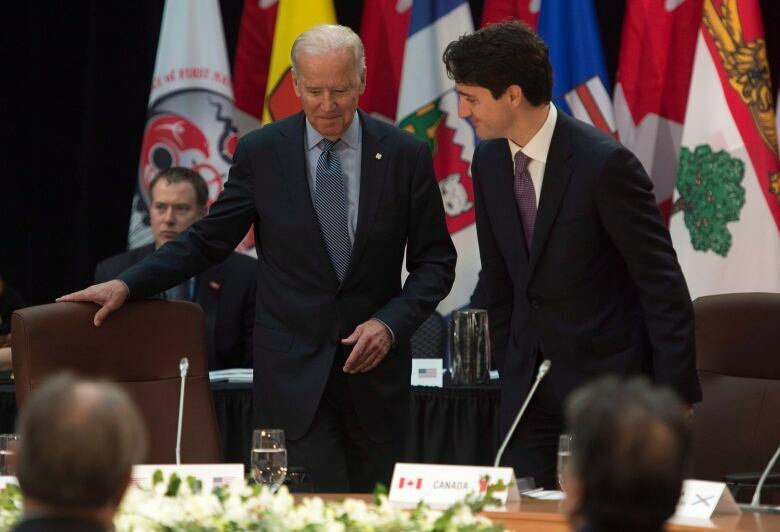 Addressing the premiers ahead of the meeting, Biden acknowledged the elephant in the room. "I understand that many of you are concerned about what the new administration will do," Biden said. "I can't speak for the next administration, but I tend to take the long view. I am absolutely confident the United States will continue making progress on this path to a low-carbon future," he said. "Regardless of whether the next administration is as aggressive as we were, there's no way to turn back." The outgoing vice-president said the push to lower emissions doesn't come from government regulations alone. Many initiatives are market-driven, he said, citing the dramatic fall in the price of clean, renewable energy such as wind and solar. He said even one of the world's climate bad actors, China, is moving ahead with a national price on carbon in the new year. "This is unstoppable … there are plenty of reasons to be hopeful, but no reason to be anything other than feeling an overwhelming sense of urgency," Biden said. "We just have to keep our eye on the ball." The vice-president praised Trudeau and the premiers for their actions thus far, and said it is up to them to pick up the mantle of climate leadership. "The world's looking at you all, and I feel a great deal of confidence because you're all here." Before Friday's meeting even began, Wall blasted the federal government's approach, which he said "unilaterally" laid down a carbon price scheme without the benefits of "due diligence" or an impact assessment. "We're about to undertake the biggest change to how Canadians tax their economy and Canadian families and there has been no economic impact assessment. I'm really worried about the competitiveness of the country," he said. "We will not be signing the framework today, for those and other reasons." Wall said Friday he is reviewing his legal options to block the imposition of a national price on his province. "We'll probably see them in court," he told reporters on his way into the talks.